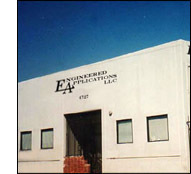 Engineered Applications was founded by President Gustavo Perez and Vice President Gil Hestmark in 1997. Over the years, EA has developed great credibility in providing high-quality service and expeditious turnaround times. 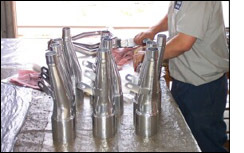 Today, Engineered Applications has aspired to a widely-known company which provides high temperature coatings for the automotive industry in general. with innovative, responsive solutions to their needs. We maximize our values through personal relationships, efficient infrastructures and value-added products and services. by recognizing, attracting and developing outstanding people with a passion for excellence. We nurture a work environment that supports humor, dynamic change, continuous improvement, creativity, enthusiasm, and good health. by treating our customers, people and suppliers in a fair and honest manner- as we want to be treated. We govern our every deed by what is just and right. in all that we do. We strive to exceed industry standards of employee care, customer service and vendor relations. We produce innovative, best value and fast turn around quality products and services. We concentrate on detail because the last five percent often separates great companies from the merely good ones. by producing strong financial performance from which everyone benefits. We stay lean, remain competitive, and produce solid profits for our efforts. by using our talents and resources to better the conditions in the diverse communities in which we live and work.